Not many people will admit that they are afraid of the dark. We like to pretend we are beyond such childlike reactions as skirting dark corridors or covering our eyes when we see something terrifying in a scary movie. The truth is, the dark is meant to be scary. It triggers some primal instinct that thousands of years of evolution have burned into our collective nerve endings. After all, who knows what lurks in those shadowy corridors of our minds? For better or worse, I fully admit I am scared of the dark, so scared that it has taken me two years to beat a game that can be finished in a matter of hours. 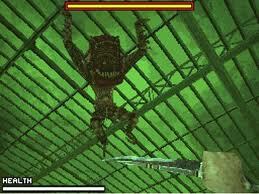 Upon beating Renegade Kid’s horror first-person shooter Dementium II, however, I realized something. Fearing the dark isn’t a bad thing when it comes to horror games—it enhances the experience. Dementium II immediately bombards you with dread the minute you turn on the power and see the hideous logo. You wake up in the Bright Dawn Treatment Center, supposedly a place of relief and healing. A kind nurse tells you that your name is William Redmoor, and that you have recently undergone brain surgery. As a guard drags you to your cell, you see many strange things, among them a blood-stained woman standing in an elevator and other guards mercilessly beating inmates. Then, you find yourself unceremoniously dumped into a stark room with iron grates. You find a postcard “from Paradise” on your bunk—written by yourself to yourself. Then, things get weird. Reality warps around you. The cell becomes a green-hued, blood-spattered, metallic slice of hell. You wander out of your cell, only to find hideous, shambling abominations like broken marionettes with gaping, tooth-lined holes in their stomachs, their beating hearts serving as tongues. Welcome back, indeed. Dementium II deals with the themes of madness, loss, and transformation. You play a man who barely survived the insanity of the first game and who may or may not be innocent of the murder of his own wife and child, a truth that remains frustratingly just out of reach. Personally, I felt invested in the possibility that William was innocent despite the lack of proof, and thus the search for the truth was one of the guiding forces that kept me playing. Another detail which made me sympathize with William was the constant abuse and mind games shouted at him over the intercom by the Doctor, the man responsible for all the evil William must face. Though I can’t reveal much more about the game without ruining it, I will say that gameplay is split between 5 chapters, which alternate between reality and some place called the Plane of Anguish. Both are fraught with peril, but reality actually ends up being more frightening. Lighting is not a constant there; you will find yourself making repeated use of the flashlight to combat the darkened corridors and rooms. One especially frightening example is when William first finds his way into the Boiler Room. You find yourself in a pitch-black room full of narrow corridors and rusty machinery. You head forward, the flashlight dispelling shadows, only to realize one shadow is standing upright and gliding towards you. I nearly jumped out of my skin at this first encounter with a Whisperer. It was far from the last one. The Plane of Anguish, though less scary, is always intense. Many more monsters populate it than normal, all of which you must eliminate to advance, and all of which can teleport nearby without warning. 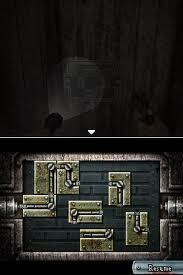 Besides shooting monsters, you will also find the occasional puzzle, which can be solved with a little effort. These provide welcome respite from the constant horror and adrenaline, as do the occasional save rooms, where you can refill your health. Gameplay is a single-player affair handled with a smart combination of the D-pad and the stylus. The D-pad controls forward and backward movement, as well as strafing to the left and the right. The stylus controls the camera and weapon sight. With a little experimentation, it will feel completely natural and intuitive. 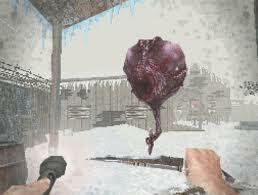 Finally, players use the L button to fire guns or swing melee weapons. Although the majority of the weapons in the game are some sort of firearm, there are a couple of unique weapons, such as the brutal Sledgehammer which must be wielded with both hands, and the mysterious Relic, which acts as a sort of supernatural boomerang, something I’ve never seen before in an FPS. For lefties, an alternate control style is available, which maps the D-pad to the ABXY buttons and firing to the R button. Also welcome is the HUD map located on the bottom screen, which keeps track of where you’ve traveled and indicates where to go next. Dementium II‘s art direction does a marvelous job presenting a well-rendered, terrifying reality. Quite frankly, the game shows off graphics that many did not believe the DS was capable of. Monsters shamble and stalk fluidly and dangerously. Well-utilized lighting and shadows make the player afraid of every inch of the darkness. Blood spatters provoke a sense of deep foreboding. The game features a variety of landscapes, such as a snow-blanketed town, a dusty, shadow-choked mine, and the Treatment Center itself. 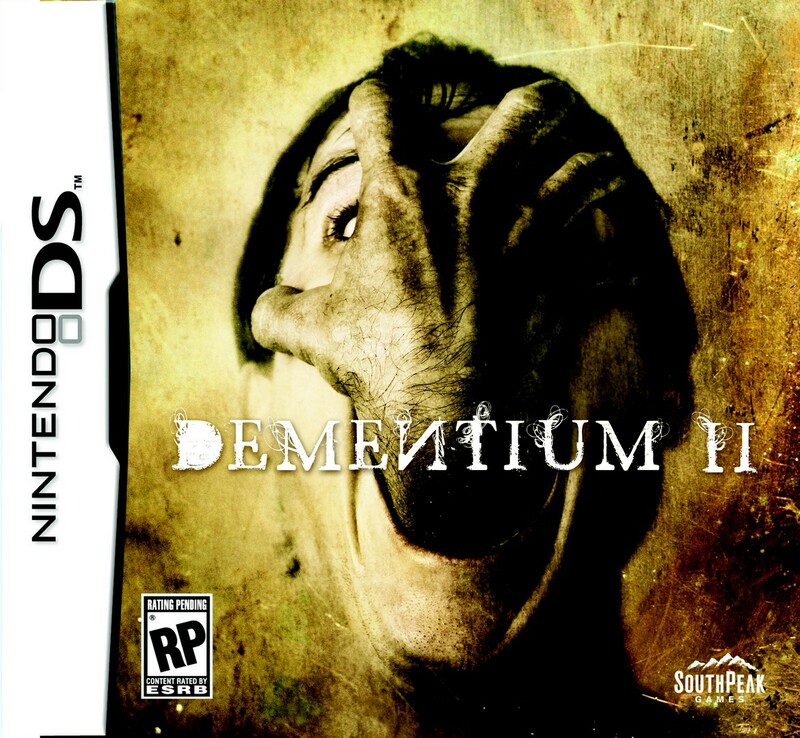 Though they may look primitive compared to the 3DS’ graphics, the visuals in Dementium II were truly top-of-the-line for the DS. Sound is also utilized quite well, perhaps even better than the stunning visuals. Many eerie, haunting tunes frame the experience, shifting to discordant, metallic tracks when you enter the Plane of Anguish. As terrifying as Dementium II looked, the sound effects were what really tapped into my fear reflex and forced me to put the game away for two whole years. Hearing the zombie-like moans of the Chest Maws, the wet, strangled crying of disembodied heads, or even the shrill violin-like Psycho-esque riff that sounds whenever a monster is near makes the spine shiver. They make all the insane visuals even more real, and that much more horrifying, since you often hear the monsters before you see them. I played Dementium II without headphones in bright, well-lit areas, and it still scared the hell out of me. I wouldn’t even attempt to play it in the dark. Not everything about the game was impressive, however. While Dementium II is a hell of a ride, it is also a very short one. I managed to beat the game, not including game overs or my two-year absence, in a mere five-and-a-half hours. Even though there is some replay value in the form of Survival Mode, it won’t extend the experience by that much longer than an hour or two. Another point of contention I have is that, while the game is fun, creepy and well-made, the plot doesn’t show the same level of craftsmanship. There is an interesting story hidden in the game, and the ending is very clever, but there are many unresolved plot issues, especially if you’ve played the original Dementium. However, I’m willing to give the sequel the benefit of the doubt, since many horror FPSes focus on gameplay over plot. Being afraid of the dark is a definite plus while playing Dementium II. Had I been one of those testosterone-fueled action junkies who scoffed at human emotion, I probably would have beaten the game in a day and thought nothing of it afterwards. As it was, my own fear, intertwined with the terror and madness present in the game, served to craft a much more memorable experience for me. Dementium II is a great FPS horror game, an unknown gem for the DS. It sports amazing graphics and sound, great gameplay and an interesting plot. While replay value is not that high, it is fun while it lasts, and true fans can extend the experience by playing it on harder difficulties and completing Survival Mode. But while I enjoyed the hell out of the game, in retrospect, I’m not sure how comfortable I would have been paying full price for such a short adventure. If you can find it cheap, however, Dementium II is a must-buy for all horror fans. When all is said and done, the darkness of our minds shouldn’t be feared—it should be embraced, a fact that Dementium II fully explores. Review is based on the DS version of the game.